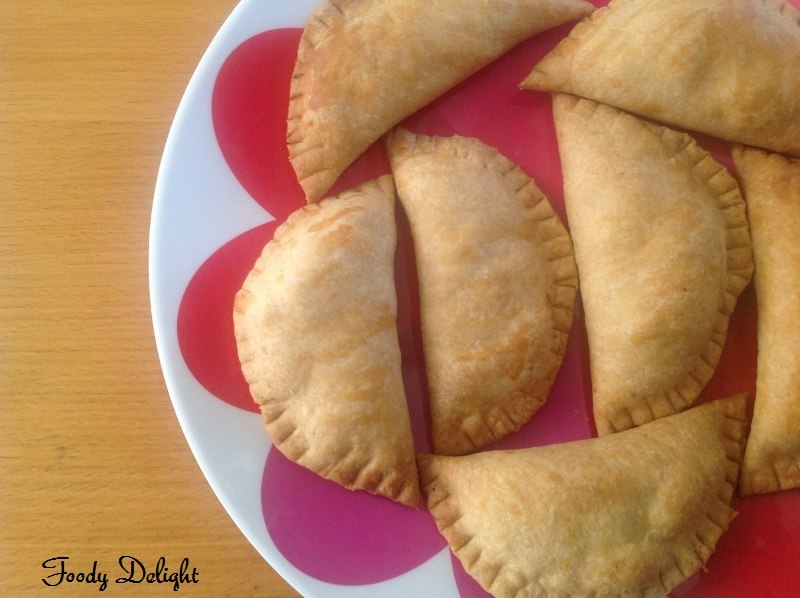 You all know, Ghugras or Karanji or Gujiyas are usually fried . 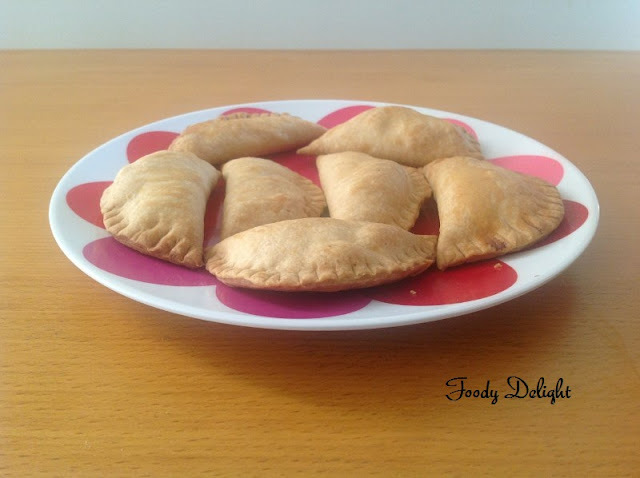 But today I am sharing non fried or baked ghugras with the sweet filling of dry fruits. 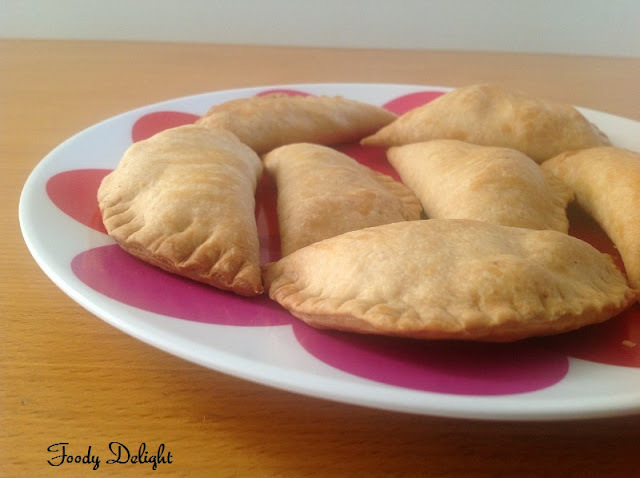 Baked ghungra are delectable snack with soft crunchy shell that directly melts into the mouth. Ghungras have many names in every home and they have their own filling recipes.Traditionally Ghugras are made using the moulds, since I did not have it, managed to give its proper shape .For the fun session with your children, you can use any shape of moulds to make these ghugras. Ghugras are the best known snack during tea time. Combine all purpose flour, chilled butter and salt into one bowl. Mix well and prepare the tight dough. If required add little amount of water while preparing the dough. Cover the dough and keep aside to rest for 30 minutes. In another bowl, combine all the above mentioned ingredients of the filling. Mix well and keep aside. Divide the dough into 20 equal portions and roll out each portion into 3 inch of diameter circle. Place the filling mixture in the centre. If using ghugra moulds, once you place the filling mixture. Close the mould carefully and press it lightly. Then gently open the mould and remove the ghugra. Repeat the same process to make the remaining ghugras. Arrange the ghugras on the baking tray lined with parchment paper. Brush the each ghugra with the milk wash and bake them on 330 F for 15 to 20 minutes. Keep an eye once the 15 minutes is over. When the ghugra gets light golden in colour, you can take them out of the oven. Enjoy baked ghugra as much you can during your favourite tea time. 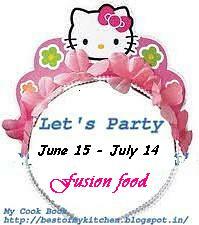 Ongoing Event - " Lets Party - Fusion food by Surabhi Nayak of My Cook Book"
that looks sooo good.. my hubby and i love ghujias i think should give this a try !!! this looks very delicious. I have never tried to bake it. Excellent and definitely a guilt free ghugras. wow.. baked kujhias.. sounds good..